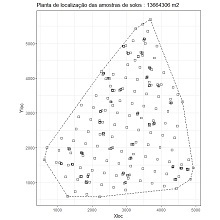 Plot an aerial view map (X, Y coordinates) of samples locations and optionally add a boundary polygon. 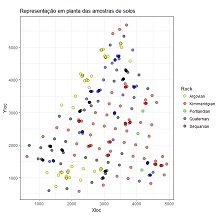 Plot an aerial view map (X, Y coordinates) of samples locations with symbol colours of a qualitative variable. 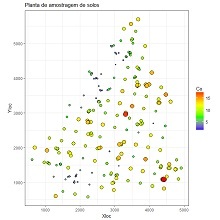 Plot an aerial view map (X, Y coordinates) of samples locations with symbol colours of intervals of a quantitative variable.